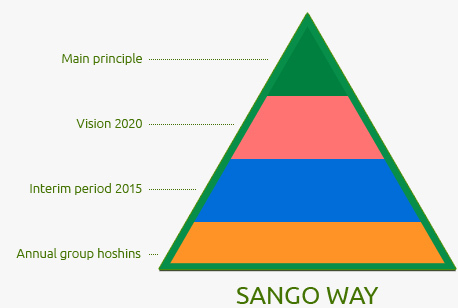 Sango Way is the set of principles explaining how an employee of the Sango Group would share the common values and act accordingly with a view to reflecting the company’s main principles on the actions of the company. If any indecision appears about the work at hand, it shall be checked asking the question “is that the Sango Way”. Contributing to the society I-Contributing to customer, supplier, local community and shareholders * as the Sango employees, we shall act as a company and community that inspire mutual trust with the customers, colleagues, stakeholders and the other related parties. This will ensure the well-being of the company and satisfaction of the employees. II - Agreement of the words with actions, implementing the statement * With an open-global point of view, respecting the different cultures-nations and individual variety. * to perform the duties with free will and all possible effort, to conclude the work and assume responsibility for the results. Bilateral communication I - Sensitive and careful approach * Approaching fairly to all issues and with equality and honesty to the individuals. Trying to approach the people sensitively and with care. II - Leadership * setting clear and high targets and developing personnel for achieving those targets through training. * The superior should strive to train and develop the subordinates. In this process, the superior and the subordinates should learn the processes from their predecessors and teach to their successors, thus exchanging information mutually. * The manager provides opportunities to the subordinates for development and sense of achievement. Moreover, he evaluates the performance of the subordinates correctly and must have a powerful enough character to assume the responsibility for their actions. II - Team work * Respecting the human qualities as an individual shall raise the full power of the team to the highest level. Becoming a company, where happiness is experienced from working together like a family, is targeted. * Understanding the reciprocal duties within the team, thus acting with responsibility to form a strong team. * The creative, innovative and relentless activities based on research curiosity and problem solving desire creates team work. II - Developing the spirit of independence, self-respect and sense of pride. - The main mission is creating added value based on high quality and original product development and surpassing ourselves for achieving our dreams with determination, pride, creativity and courage. * Developing the awareness of being responsible about something, being able to take care of the self and having the sense that one should do what it has to do. * Keeping long-term success in mind at all times, planning realistic intervention plans, generating flexible scenarios and further developing them. II - Direction of emphasize and general optimization * In the cases, when the present or future conditions are obscure, understanding the methods for preventing the risks and decided about them with awareness. * Regarding with a wide angle of view and placing high priority in general optimization. * Targeting progress with creative ideas without being bound by comparisons or taboos and without giving up in desperation. * Using the old materials wisely and avoiding the purchase of unnecessary materials and making defective parts. * For all the processes, the next process is considered as client and the required product is manufactured at the right time, right place and in the right quantity. * Meeting the customers’ demand fully. Complete organizational learning I - Information sharing, standardization, Yokoten (spreading the improvements to the aides and all applicable areas. II - Deriving lessons from the mistakes * To develop the Genchi-genbutsu approach, in which the differences can be categorized, through the active use of the visual check etc. techniques. II - Understanding the issues and searching for the root causes - In order to gain a deeper comprehension, we need to see the realities at the event location with a “Genchi genbutsu” spirit. II - Placing importance in the process * Trying to form a consensus by collecting the different ideas of different individuals and partners related to the applicable issues. * Being conciliatory during the target achievement process and placing importance in the process. II - Solving the programs with persistence and without giving up * If environmental changes are faced, first a trial is made (temporary action). Before declaring the issue “impossible”, action is taken and applied before criticizing. * When a decision is made, all the employees focus collectively on the issue at hand adhering to the completion deadline and within a short time.